Food storage can take many different forms, depending on how much and what kinds of food you are keeping fresh. Will it be refrigerated, frozen, or kept out? Food, drinks or ingredients? Would you like it out for display? Plastic and glass food storage containers are usually appropriate for leftovers with their airtight seals and clear visibility into what you're keeping refrigerated. 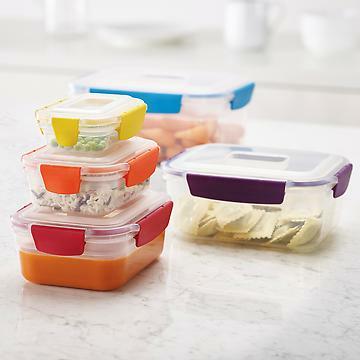 Glass food containers are also BPA free, and can go right into the oven for prepared food or leftovers that need cooking. Jars and canisters, on the other hand are great for countertop food and ingredient storage like spices. Our collection of food storage products is second to none. Here, you'll find everything you need, from beautiful countertop solutions for dry goods to products for storing Fido's kibbles. All of our food storage containers are BPA-free.